Social media is one of the most important contributions of modern technology. Today, almost every person has a virtual social life that is almost as vibrant, if not more, than their real social lives. 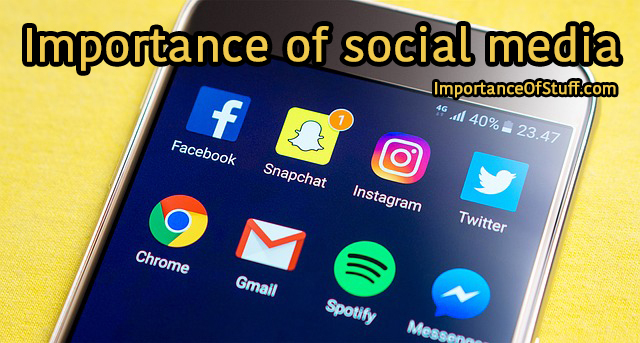 It is no longer only just Facebook, which is undoubtedly one of the most prolific and widespread social media websites there is in the world right now; there are a multitude of other social media websites and apps that have taken over the internet. While most of the world is hooked on those communicative websites, the rest of the world, and in many cases, those very people hooked on social media, are well aware of the dangers these websites pose. In this article, let us talk about how social media has influenced our lives. To begin with, social media is one of the most important sources of information. Today, every news that is seen on the internet and in the news networks is immediately shared by thousands of people over social networks, and it takes seconds for a piece news to reach all corners of the earth. We are able to know about earthquakes happening in Japan and Haiti while we are sitting in a small corner of Kolkata, and we know what concerts are being held in Los Angeles when we are sitting in a small province in rural China. Thanks to social network, we have truly become a global community that can share in each other’s triumphs and tribulations. Social media is one of the most important sources of communication for all of us. Today, we are even more connected through social media than we are through phone calls and messages. And, thanks to the fact that most of us use smartphones, we can stay connected on the go through social media. It is much less expensive than phone calls, and it enables us to stay connected with people from far and wide all the time. When people share updates about their lives on social media networks such as Facebook and Twitter, we get to know what they are doing, where they are enjoying tier holidays, and even what they are eating. Social media has enabled us to communicate visually, which enables us to take an active part in each other’s lives. Social media is today being hailed as a platform for voicing our opinion. We can tell people what we are feeling about certain things that are happening all around us through social media websites. Facebook and Twitter are today filled with news items from all across the world that provoke us to express outrage or makes us clap in approval, and we can do both on the global platform that is social media. We can tell people that we approve certain measures taken by the government, and we can criticize actions and events taken by governments and individuals and communities. The ability to stay anonymous if you choose is a great advantage of social media if used in the right way, and this enables may people to express their opinions who would otherwise be at risk if they were seen expressing themselves. Social media is not just a platform for empty expressions. This is a great platform for bringing about social change. When a significant section of the society expresses disapproval against something, or hails something as an important change for the betterment of the society, it forces the government or the ruling authority to rethink its decisions. The people of a community find a platform for protest in social media, and as a definite method of forcing the government to listen to their demands. People are being made more aware of what is happening in the world, and of the consequences of certain measures taken by the ruling or governing bodies. Not everyone has the ability to showcase their talents through agents and prodders, as that costs a lot of money. Social media has enabled people to let the world know of their talents through sharing videos of themselves on social media. Sites like YouTube are filled with recordings of extremely talented singers, actors, makeup artists, and painters. It is a very positive platform for budding artists to expose their talents to the world, gain constructive criticism and feedback, and in the process improve their performance. Social media is not just a platform for sharing updates about yourself with the rest of your community. Even though it began as a way to engage in conversations and staying in touch with relatives and friends living in different parts of the world, today social media has grown to encompass a lot more than that. It is one of the most influential media in the globe today, with billions of people interacting with each other and sharing their opinions. For the first time in history, this is a platform that has truly brought people together.